If you need to pick up a passenger from SMF Airport, you may want to use the free Cell Phone Lot (for up to 3 hours) located off Crossfield & Lindbergh Drive--stay with your car until your party has collected luggage and calls you to be picked up at the curb. 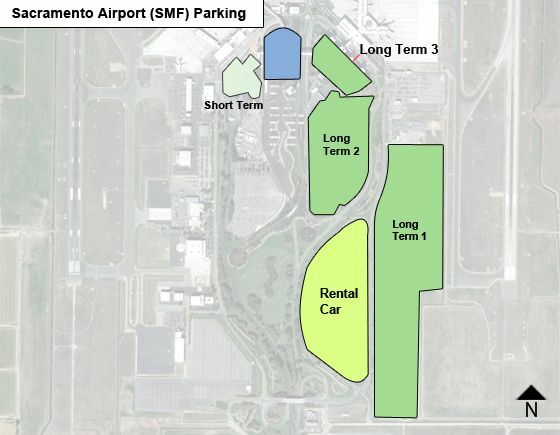 Other parking options & fees at Sacramento International Airport: Hourly parking is in Garage B, Daily parking is in garages A & B; Both Daily & Economy surface lots are served by shuttles. Parking is available on first-come, first-served basis. Include extra arrival time in case the Garage is full and you need to go to the Surface/Overflow lot. EV charging stations with J1772 units (follow signs) are located in the garages. Fees: each 30 mins $2 up to daily max $29. Garages A & B Daily Parking - on levels 1-6, with pedestrian bridges leading to TA on level 3 and to TB on level 5. Fees: each 30 mins $2 up to daily max $18. Daily Lot for Terminals A & B (on Airport Blvd. prior to garage entrance), with shuttle service every 10-15 mins. Available at first-come, first-served basis. Fees: each 30 mins $2, up to daily max $12. Economy Parking is on Aviation Drive, across from the rental car building, and serving both terminals, with free shuttle bus transfer every 15-20 mins. NOTE that it can take up to 45 minutes to get to your terminal. Fees: each 30 mins $2; up to daily max $10. For current parking status call 916-874-0670. An ARCO service station is on Airport Blvd. West, next to United's Air Cargo. Where is and how much is long-term parking for HDCP?